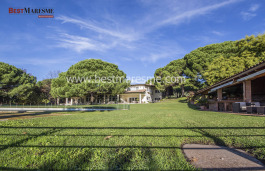 Property located in A residential area in the center of the town of Cabrils on the Coast of Barcelona, ​​its location makes it very practical while you can enjoy peacefulness, a private garden and pool. 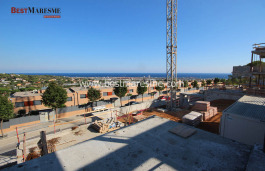 Close to all amenities, schools and public transport make it the best bid to live in it throughout the year only 5 minutes from the beach and 20 minutes from the city of Barcelona. Built by its current owners in 2005, with quality materials and distributing the spaces thinking of each of the family members. On the main floor and from the hall, we see the living room with and it's two different areas opened to the garden, a large eat-in kitchen, a separate laundry room, a housekeeper room or guest room including courtesy room. On the first floor, the sleeping area with four bedrooms and a bathroom. To highlight the large master suite with wood-paneled ceilings and double height attic area used as a gym or private office, bathroom with tub and shower and a wall made of glass that connects the sleeping area with the dressing room. A solarium type terrace. From this floor and through a staircase designed in wood and iron, we reach the games room for the youngest. Among the extras inside the house, we find the floor heating, home cinema in the lounge with hidden screen that is managed via the remote control, varnished marble floors Zenia brand and parquet, central vacuum, etc .. The porch with wooden beams is a nice place to enjoy the garden next to the infinity pool and the barbecue area. 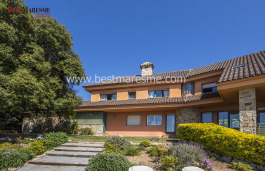 Garage for one car and motorcycles, with cellar or storage area and changing rooms with a fully equipped bathroom very comfortable when being at the pool. 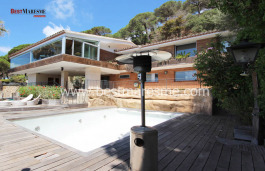 A luxury to enjoy the climate of the Maresme during the whole year round.